At the beginning of this term, I spearheaded the development of Toronto’s first-ever comprehensive and city-wide Road Safety Plan. The City has now embarked on a five year commitment to make real changes to our roads to make them safer for everyone. On the first day of school, I unveiled the City’s latest measure to improve road safety – our School Safety Zones. By the end of the year, we will have 22 School Safety Zones in place, with another 20 in 2018 and each year after that. Staff are also extending the coverage of enhanced pavement markings up to 250m away from schools in support of active and safe routes to school. The prioritization of school zones are based on consultation with the Toronto District and Toronto Catholic District School Boards, local Councillors and the police and takes into consideration the number of collisions in the area and the area’s walkability index. The list of schools will be provided to the Toronto Police Services in order to increase enforcement. Accelerated the implementation of the Pedestrian Safety Corridor program. By the end of the year, there will be 46 of these corridors which include a variety of measures to reduce safety risks for pedestrians. Rolled out Senior Safety Zones, which include increased walk times at traffic signals, improved pedestrian markings and better signage. To stay up to date, check out our website toronto.ca/VisionZeroTO. 2017 is shaping up to be a banner year for Toronto’s Vision Zero Road Safety Plan. Since 2015, as Chair of Public Works & Infrastructure, I’ve championed the creation of a comprehensive strategy to improve safety on our roads. Last summer, City Council unanimously adopted Toronto’s Road Safety Plan and since then, we’ve been implementing safety improvements on streets and at intersections across the entire city. In the coming months, we’re focusing on improving safety for seniors and children, our most vulnerable road users. Since the winter, city crews have been fast-tracking the creation of 12 Seniors Safety Zones across Toronto. These zones involve increasing walk times at traffic signals, enhancing pedestrian markings and improving signage and street lighting. As we head into summer, our next big push is School Safety Zones, which we’re aiming to have in place for September at a number of schools to coincide with back-to-school and the shorter days of the fall season when there are typically increased rates of collisions. Last month, I was also pleased to host Toronto’s second annual Vision Zero Summit, which brought together more than 20 stakeholder groups and road safety experts to discuss progress on the Road Safety Plan and our next steps as a city. It’s always a great discussion, and I’m already looking forward to next year’s Summit! To learn more about the safety improvements planned for 2017, check out our website toronto.ca/VisionZeroTO. Since 2015, I’ve championed the creation of a comprehensive strategy to improve safety on our roads. Last summer, City Council unanimously adopted Toronto’s Road Safety Plan and since then, we’ve been implementing safety improvements on streets and at intersections across the entire city. In the coming months, we’re focusing on improving safety for seniors, our most vulnerable road users. In 2016, 86 percent of pedestrian fatalities were aged 55 and older. With that in mind, city crews have been fast-tracking the creation of 12 Seniors Safety Zones across Toronto. These zones include improvements such as increasing walk times at traffic signals, reducing speed limits and enhancing pedestrian markings, signage and street lighting. To learn more about what’s planned, check out our brand new website toronto.ca/VisionZeroTO! Transportation Service’s Street Furniture Management team has been hard at work this winter, preparing for their 2017 installations. I’m pleased to share that Ward 25 will be receiving 11 new transit shelters, 38 litter receptacles, 4 benches, 1 poster structure and 1 publication structure. Also, as part of the Street Furniture Program, the city is offering Business Improvement Areas (BIAs) the opportunity to request the installation of on-street benches for up to the entire BIA area, free of charge. With the goal of improving the amenities around businesses and the community, the city will work with BIAs to determine feasible bench locations, and BIAs will get to choose the bench colour. For more information, please contact Antonia Markos at antonia.markos@toronto.ca. Did you know you can now find and pay for parking through the Green P Parking App? The app allows customers to pay for parking, receive reminders that a session is about to expire and extend their parking sessions right from their smartphones. The app payment option is available for on-street parking and pay-and-display facilities across Toronto – just look for authorized Mobile Pay signs. Unfortunately, the app is not available for older Blackberry devices or Windows phones. However, users can access parkgreenp.com from a mobile web browser. All previous payment options, such as credit cards and coins, remain valid at pay-and-display machines. Click here to learn more about the Green P Parking App. Please note that as of December 30, 2016, the city’s credit card telephone payment option for parking tickets is no longer available. Parking tickets can still be paid online, by mail or in person. Visit this website for more information about payment options. Battling congestion and gridlock has been one of my top priorities during my two terms in office. Every single day, I hear from residents frustrated by private developers who stage construction projects on our streets, resulting in prolonged lane closures and congestion. As Chair of Public Works & Infrastructure, earlier this term I fought tooth and nail to clamp down on private construction by increasing fees for street occupation. As a result, fees for developers have now jumped from $5.77 per square metre per month to a maximum of $105.41 per square metre per month. Unfortunately, private developers simply aren’t getting the message. At this month’s meeting of City Council, there were three items on the agenda related to construction areas and lane closures in the downtown core. The proposed closures would have shut down traffic lanes for two to three years, causing real pinchpoints in our road network and significant congestion. I voted with my Council colleagues to reject these wholesale closures and directed staff and the developers to consider other options. These alternatives might include further increasing street occupation fees, using side streets and laneways or working within the footprint of the development. I look forward to reviewing the revised proposals at next month’s City Council meeting. The bottom line is that the status quo isn’t working – it’s time to start focusing on the public interest instead of catering to private construction. Autonomous, or self-driving, vehicles will soon be a reality on Toronto’s streets. Earlier this spring, I requested Transportation Services draw up specific recommendations on how the City of Toronto and its various divisions can prepare for the arrival and expansion of autonomous vehicle technology. As Chair of Public Works & Infrastructure, I want to make our city a leader in transportation planning and innovation. Driverless cars could be available in North America in significant numbers as early as 2020. By 2030, up to 15 percent of new cars could be fully autonomous. As of January 1, 2016, Ontario became the first province in the country to allow companies to road test autonomous vehicles. The introduction of autonomous vehicles into our society is going to bring new opportunities and new challenges – that’s why it’s imperative that Toronto make strategic decisions now to shape the changing technological future of our city. You can read my motion by clicking here. Staff will be reporting back to the Public Works & Infrastructure Committee by the end of this year, so stay tuned! At the beginning of the last term, one of the first things I did in my new capacity as Chair of Public Works was to call for a comprehensive, city wide road safety plan. In 2015, we had 65 road fatalities, of which 39 were pedestrians and 4 were cyclists. In addition, over 70 percent of the pedestrians were seniors, our most vulnerable road users. So far in 2016, the numbers have not improved – 20 pedestrians have died on our streets and 80 percent of them have been over the age of 65. It’s time to take action on road safety, and I’m pleased to share that our first-ever Road Safety Plan (RSP) is complete after over a year of extensive data collection and consultation with key advocacy and community groups. As part of the plan, we’ll be creating 25 pedestrian safety corridors in areas of the city identified through geospatial and trending analysis as “hot spots” for collisions. This will involve implementing advance green lights for pedestrians, adding or enhancing line markings and implementing turning restrictions at certain times of the day. City staff will also be conducting 14 safety audits of intersections and corridors with high numbers of collisions to determine which countermeasures would be most effective at that specific location. From the very beginning, my goal has been to eliminate traffic-related fatalities and serious injuries. Earlier this year, I also put forward a motion directing staff to develop a Seniors Strategy as part of the RSP. Seniors are a growing demographic in our community, and we need a targeted strategy to tactically improve their safety on our streets. You can read the full staff report on the RSP, along with 10 appendices, here. Many thanks to Mayor John Tory and Stephen Buckley, General Manager of Transportation Services, for joining me for the launch of the city’s proposed Road Safety Plan. With warm weather comes increased construction activity on our roads. This year, after an extensive push from my office and countless meetings with senior staff, over 20 roads in Ward 25 will be undergoing reconstruction or repairs. If your street is scheduled for repaving and you would like more information about the timing of the road work or the type of work to be completed, I encourage you to reach out to Bruce Shaw, Supervisor of Road Operations, at bshaw2@toronto.ca. If you live in the York Mills neighbourhood and road reconstruction is scheduled for your street, you can learn more about the work by contacting the project manager, Angela Au at aau2@toronto.ca. For questions about the Lawrence Avenue East road reconstruction, I encourage you to contact Pezhman Imani at pimani@toronto.ca. For any work taking place on Old Yonge Street or Plymbridge Crescent, the best person for you to contact is Javier Saborio at jsabori@toronto.ca. If you have any questions about the work scheduled for these roads, I encourage you to contact Sinead Canavan, Program Manager, at scanava@toronto.ca. If your street is not included in the above list but is in poor condition, please let me know at Councillor_Robinson@toronto.ca. City staff have the final say in scheduling road work, but I’d be happy to bring your concerns to their attention or request that any interim repairs be completed as soon as possible. As Chair of Public Works & Infrastructure, I’m pleased to share that the city is engaging in an aggressive program of road construction and watermain replacement to improve its aging infrastructure. In 2016 alone, we’re investing more than $550 million to maintain and improve our city’s core infrastructure, including $260 million on roads and bridges, $227 million on sewers and watermains and $71 million on basement flooding protection. This construction work will have real long-term benefits for Torontonians such as improved transportation corridors and better public transit. While necessary, there’s no doubt that construction causes disruption and inconvenience to road users and other residents that share the public realm. In recent years, the city has embraced a multi-year capital coordination process to streamline and synchronize capital projects. Leading this process is the Major Capital Infrastructure Coordination Office (MCIC), established in in 2008. A multi-year perspective ensures that capital work is being completed in the right order. This means, for example, that underground work will precede construction at grade. A multi-agency approach helps achieve efficiencies in construction such as effective work-zone coordination or joint excavation. A multi-stage process further works to minimize disruption for residents by, for instance, coordinating with transit operations and ensuring proper maintenance of equipment. The bottom line is that the city is taking important steps to ensure that capital projects follow a predictable, logical and cost-effective path to delivery – all to get this needed infrastructure work done with the least amount of inconvenience and disruption. To stay up-to-date, check out T.O. INview, a web-based mapping system showing the locations and details of planned capital projects. It was great to work with local advocacy groups and organizations at my Road Safety Strategic Plan Roundtable on January 25, 2016. As Chair of Public Works, I initiated the development of a comprehensive, city-wide Road Safety Strategic Plan (RSSP) nearly a year ago. Last month, I was pleased to host a roundtable in Council Chambers, which brought together local community and advocacy groups, city and provincial agencies and elected officials to share information and best practices about road safety. We had an outstanding turnout and response. Representatives from more than 24 organizations across our city sat down at the table and took part in an open, respectful and insightful dialogue. It’s time for Toronto to take a leadership role in developing a strategic, proactive approach that draws together our existing safety initiatives and identifies specific, data-based countermeasures to reduce road fatalities and serious injuries on our roads. A draft of the Road Safety Strategic Plan will be coming to the Public Works and Infrastructure Committee in spring 2016. As Chair of Public Works, I was pleased to announce Phase 2 of the city’s Congestion Management Plan with Mayor Tory. There’s no doubt that traffic is top of mind for Toronto residents. Congestion costs our city almost $11 billion-a-year in lost productivity. Getting Torontonians moving was one of my top priorities in the first year of Council’s new term and it remains so going forward. 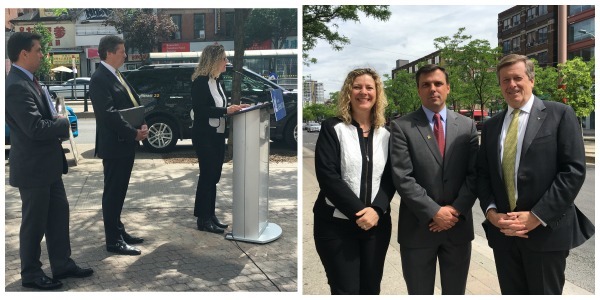 For that reason, I was pleased to help announce the next phase of the city’s congestion management strategy earlier this month. On this last initiative, I led the charge last spring to clamp down on private construction by increasing fees for street occupation. Those fees have now increased from $5.77 per square metre per month to between $26.35 and $105.41 per square metre per month. An essential component of the 2016 plan involves the use of Big Data, or vehicular probe data, which I helped bring forward last winter. You can read my motion here. Big Data has enabled staff to identify the city’s most congested intersections and corridors and will aid in the development – and implementation – of context-specific, evidence-based action plans to improve traffic flow. You can read more about 2016’s congestion management initiatives here. For an update on the city’s long-term Congestion Management Plan, click here. As Chair of Public Works, I’m committed to making our roads safer for all users – motorists, pedestrians, cyclists and transit users. That’s why, earlier this year, I moved a motion asking for a comprehensive Road Safety Plan for Toronto to reduce traffic-related deaths and injuries on our roads. Further, at this month’s Public Works and Infrastructure meeting, I requested that an easy-to-use Traffic Calming Options Manual be developed as part of the Road Safety Plan. The manual will outline all of the different traffic calming options and their impacts, costs and effectiveness. The goal is to make the information about traffic calming alternatives transparent and accessible to everyone – whether you’re a city official, traffic expert or resident. A draft of the Road Safety Plan will be coming to the Public Works and Infrastructure Committee in 2016. The new splash guards provide safe passage along the bridge for pedestrians in Ward 25. They’ll create a safer walking route for travel to and from the Crescent School, the Toronto French School, the York University Glendon Campus, and the Granite Club. Many thanks to Gary Gund, Allan Vice and Bruce and Cee Cee Robertson for helping to make this happen! Splash guards on the Bayview Bridge. Every fall and winter there is an increase in the number of pedestrian and cyclist collisions on city roads due to reduced daylight hours. It’s key that drivers, pedestrians and cyclists become more aware of other users as they travel on our streets throughout these seasons. One of the best ways to ensure safety is to stay focused on what you’re doing – whether you’re driving, cycling or crossing an intersection by foot. Don’t talk or text on your phone. Be aware of your surroundings. Always yield to pedestrians at crosswalks. Note that pedestrians in dark clothing can be difficult to spot during the fall and winter months. Take extra caution at nighttime and during wet or wintery weather conditions. Cross streets at traffic signals, intersections and crosswalks. Always look carefully before crossing and make sure all vehicles are stopped. Wear bright clothing or clothing with reflective materials if possible, especially at night. Drivers often have a difficult time seeing pedestrians in dark clothes. Make sure you have both front and back lights for your bike and turn them on when riding at night, dusk or dawn. Wear clothing and other cycling accessories with reflective materials. Congestion is an $11 billion-a-year problem in Toronto and it’s my key priority as Chair of the Public Works and Infrastructure Committee. Earlier this year, I directed city transportation staff to explore how we can use big data to understand, evaluate and reduce congestion and gridlock. Big data focuses on using advanced analytics to mine and make use of massive amounts of information from different sources, such as GPS locational data, traffic cameras as well as Bluetooth and wifi information – to name a few. In October 2015, I helped kick off the city’s first ever Hackathon. Cosponsored by Evergreen CityWorks, the event brought together more than 150 talented individuals from across disciplinary lines and gave them 48 hours to jump start solutions to gridlock using a variety of different data sources. Click here for more information about the Hackathon and the winning ideas. 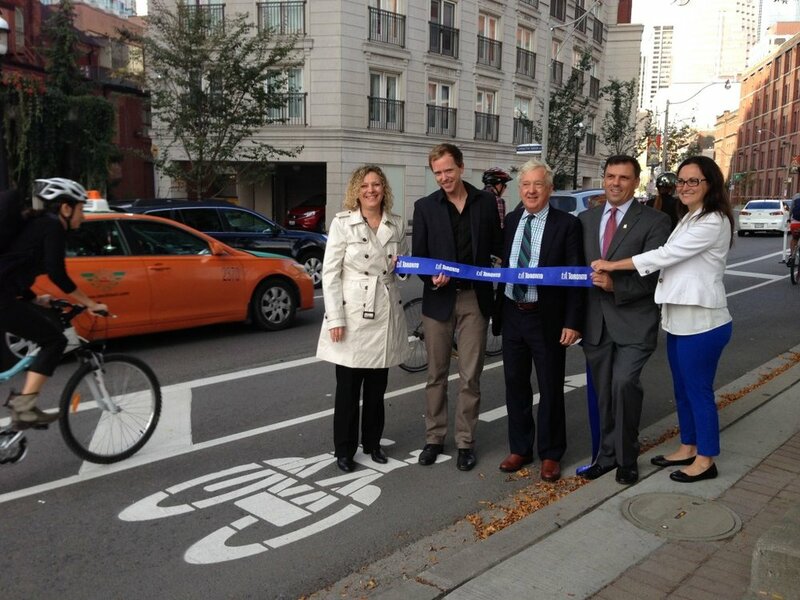 Opening the extended cycle track on Richmond with Jared Kolb, Executive Director of Cycle Toronto, Alan Heisey, Vice-Chair of the TTC, Stephen Buckley, General Manager of Transportation Services, and Jacquelyn Haywood Gulati, Manager of Cycling Infrastructure and Programs. In 2014, the city installed separated bike lanes (cycle tracks) on Richmond Street and Adelaide Street from Bathurst to York/Simcoe. This pilot project assessed the feasibility of separated bike lanes on these corridors. In June 2015, the Public Works and Infrastructure Committee received a report on the pilot. Early results are promising! Cycling volumes on Adelaide have tripled while those on Richmond have more than doubled. Even better, there’s been no negative impact on congestion. You can read highlights from the evaluation report here. As chair of the Public Works and Infrastructure Committee, I moved a motion to extend the cycle track pilot on Richmond and Adelaide east to Parliament. The Richmond extension is now complete, and work on Adelaide is underway and will be completed later this fall. I chaired the Public Works and Infrastructure Committee in summer 2015 where we approved a pilot to apply acceleration and delay costs in construction contracts. The goal is to reduce congestion by speeding up construction on city roads, particularly high-traffic corridors. Other jurisdictions, including Ottawa and York Region, have had success in applying acceleration and delay costs to high-priority construction projects. City staff will report back on the pilot to the Public Works and Infrastructure Committee in 2017. Along with the warmer weather comes road improvements across the Ward! The future of the eastern section of the Gardiner Expressway is a once in a lifetime decision that will shape the future direction of our city. A hybrid approach that would keep the expressway linkage between the Gardiner and DVP. Public consultations are a critical part of the decision making process and are now underway. It’s a complicated decision. We have to balance travel time impacts, unlocking the incredible opportunities on the waterfront and financial cost. As the Chair of Public Works, my priority is to make the right decision for the city. To get involved or to learn more about the issues, please head to www.gardinereast.ca. Following the public consultations, city staff will prepare a report with a recommended option for May’s Public Works Committee meeting and City Council will make a final decision in June.